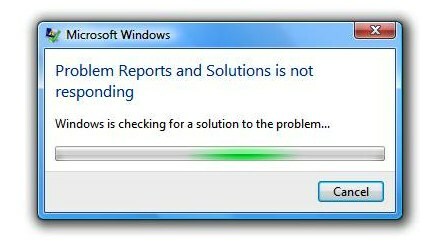 This is like the Inception of Windows errors; there’s a problem with “Reports and Solutions” so Windows is checking for a solution to that problem. Will it ever end or do we have to go deeper into this infinite Windows failure loop? I’m just glad I no longer use Windows on any sort of regular basis, although I do have to use Internet Explorer on the Mac from time to time for browser testing… and what fun that is. Thanks for sending this picture in Greg. LOL I run three hackintoshes… two as final cut machines, and can only count on one hand the number of times they have frozen or kp’d in the past 6 months. If your genuine Mac is having that many issues, you really need to get it checked. my mac only freezes up for secs when using ram stealing programs. how ever my mac now freezes when you recharge the battery after it comes out of hibernation. Oh and don’t buy memory from them, 504 dollar for 8gb in the Apple store, 104 dollar on Amazon. What is up with that Apple? That’s a 400 dollar profit you basterds. @rudolph…I absolutely would not ‘put up with it’ ….Macs dont crash, period. Take it back and demand they fix it, it’s still under guarantee so if they wont then escalate it to apple and threaten legal action. My mac has been on permamanemtly for the last 6 motnhs, not a blip in that time. AMEN to that, Brotha- I switched back in 2002 (the original iPod was my undoing), and I’ve never looked back! When an error happened and the error handler had an error, did it mean there was no error in the first place??? I was left scratching my head and laughing my head off at the same time. are you Shaun Rein from Shanghai? If you don’t want to experience foolish error messages any more, you’d better try some distribution of GNU/Linux. Ubuntu is a good example. P.S. Although Mac doesn’t have many of such problems, it has funnier problems. Why should Apple patent the sort of disc drives used in Mac Books? Anyone who thinks Windows is more problem prone than OS X is stuck in the XP or Vista era. Windows 7 is very solid, and far more flexible than OS X, including Lion. OS X has yet to provide a capable file management system (the Finder), and OS X is far more subject to hung processes than Windows 7. How do I know? I use both systems for doing real stuff. In terms of tightness, OS X is a VW, and Windows 7 is a Porsche. In terms of style I wouldn’t completely reverse it, but OS X wins. And, in terms of consumer ecosystem, OS X dominates.